After a very long day at work, and an ungodly commute home…the King just wanted to relax. It seems my mind has been thinking about one thing…and one thing alone. I’m sure you have all guessed what that one thing is…no, not beer. Why it is mountain biking of course. With a nice rain free four day weekend ahead of me, I was thinking I could get lots of single track riding in but then I remembered that most of the trails around here are either too wet or so clogged with downed trees, riding would be difficult at best. I think I need a road trip…the spur of the moment kind of thing. Oh…I just remembered…I have a beer to drink. 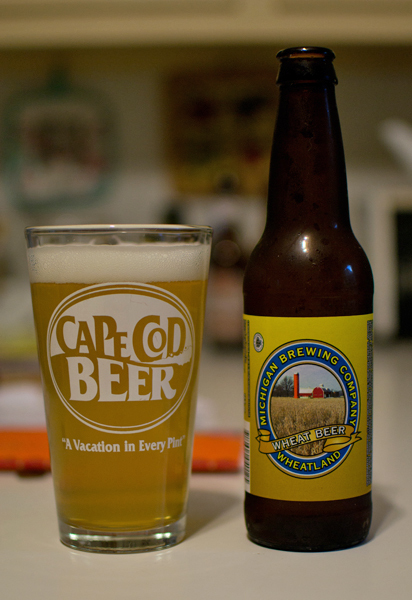 Beer #277 is Wheatland by Michigan Brewing Company from of all places…Michigan. This Hefeweizen has an ABV of 5% and is another beer in my birthday gift of the beer of the month club. This poured a cloudy pale yellow with a fizzy white head. The nose was pretty weak and I couldn’t really pick out much of anything other than a bit of wheat. It was disappointing taste wise…it had a wheat flavor with a bitter bite and a crisp finish. The body was very thin with quite a ton of stinging carbonation. While this wasn’t horrible…it was all that great either. Another day, another beer, another Troegs. Beer #228, DreamWeaver by Troegs Brewing Company, comes to me from Harrisburg, Pennsylvania. 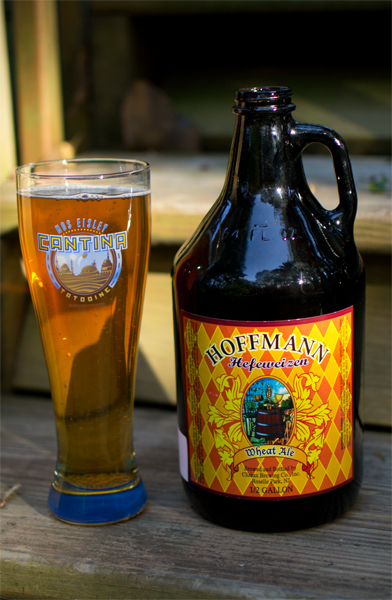 Brewed in the style of a Hefeweizen, this German style wheat beer has an ABV of 4.8%. I broke out the Sunshine Pils glass for the pour. The color was a cloudy gold, very similar to pineapple. There wasn’t much of a head to speak. The spiciness of the cloves comes through loud and clear in the nose. As expected for a Hefeweizen, bananas also fill the nose with pleasant aromas along with a decent yeast presence. It had a nice taste with the bananas, a slight orange citrus thing, and a bit of bubblegum. There was a bitterness near the back end of the sip that I liked. It had a medium body with moderate carbonation and a nice crispness to it. I liked this quite a bit. Very refreshing and light on the alcohol make this a wonderful summertime brew. After a 15 mile bike ride on the Delaware & Raritan Canal rail trail, I was thirsty. As I was deciding how to quench that thirst at the train station of the New Hope & Ivyland Railroad, I got the whiff of ground beef being cooked and that made me hungry. I took a look over to where the lovely smell was coming from and lo and behold I saw Triumph Brewing Companys New Hope, Pennsylvania location. I figured why not kill two birds with one stone, hunger and thirst. Sitting on the outdoor patio watching the tourist train of the New Hope & Ivyland Railroad is where I had the pleasure to enjoy beer #210, Zitronenweizen by Triumph Brewing Company of New Hope, Pennsylvania. Zitronenweizen is a Hefeweizen with an ABV of 4.8%. Out came the beer in a pint glass and it had a hazy pale gold or yellow color (sorry…it looks hazy pale orange to me in the photo…new phone…have to learn how to take a good photo with it) with no head whatsoever. I was so thirsty, I took a sip before even smelling it but when I did smell it I got aromas of wheat, grass, lemon, and maybe peach or apricot. The taste was tart and lemony with a nice wheat backbone and a nice spicy flavor that I couldn’t really identify. This was quite refreshing and smooth with a medium-light body and low carbonation. It was a nice after ride drink and one that worked well on a nice summer day that today was…so much so I had another. It went well with Triumph’s Brewhouse Burger…yep I got my fix of grilled ground beef and it was quite delicious! Great day…great ride…great burger…yummy beer…what more could I ask for? After waking up with a slight hangover from too much of the Black & Red I enjoyed yesterday, I really wasn’t in the mood for a beer today. As the day went on, my mood changed so I figured why not give today’s beer, #209, the old college try. What the heck is the old college try anyways? 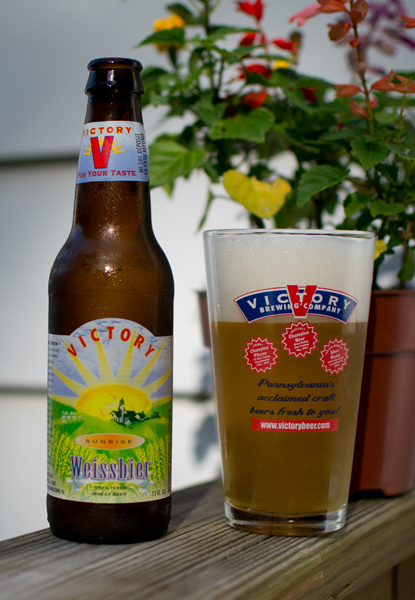 Anyhow, let me introduce Sunrise Weissbier from Victory Brewing Company which is brewed in the quaint town of Downington, Pennsylvania. Sunrise is a Hefeweizen with an ABV of 5.7%. I actually had a Victory pint glass for the pour. The color was a hazy pale yellow or maybe gold with a huge frothy white head. The nose was straight up Hefeweizen with a spicy clove presence, bananas, citrus (lemon), and surprisingly Bazooka Bubblegum. The taste was lemon zesty and heavy on the wheat. I didn’t get all of the other aromas like banana or the cloves. Odd. It had a lots of tight tingling carbonation with a fairly light body. This was OK but nothing to write home about. For me it was maybe slightly better than average. But what do I know…I’m just a King…who enjoys beer and sometimes I enjoy that beer too much. I will be breaking out my New York Yankees glass for the next few beers in honor of The Captain, #2, Derek Jeter. As I type this he has just gotten hit #2994, just 6 shy of 3000. I hope he gets it in the last 4 games of this home stand instead of on the road. Beer #197 is Lilja’s Heifer Weizen by Sand Creek Brewing Company from Black River Falls, Wisconsin. Stats – Hefeweizen with an ABV of 5.3%. 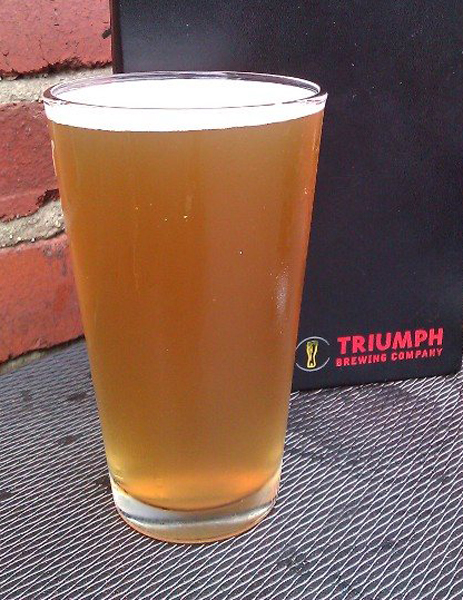 Appearance – Hazy pale golden yellow with a frothy one finger width white head. Excellent lacing did that head leave behind. Nose – Bananas, slight clove aroma, some grass, spicy. Taste – Fairly light taste wise, bread, wheat, just a tad bit of sweetness, maybe some lemon, slightly bitter, odd aftertaste. Mouthfeel – Low carbonation, smooth and creamy, somewhere between light and medium body. “Brewed behind the cheddar curtain” is printed on the label. I liked that and the nose but the taste just kind of fell off the cliff for me. Shame, because up until the taste, this was looking and smelling to be a very good beer. Not that is tasted bad, it just didn’t live up to the the aroma.